WorldVenture missionary Brenda Allen shares how her health and education backgrounds are making a real difference among the youth in Guinea. Q: Tell me about the students in Guinea. What are they like and what’s it like ministering to them? A: I work with about 45 different students, along with my national colleagues, and we have two emphases in the after school club, which is a voluntary thing the kids sign up for. The kids are almost from completely Muslim families, but the class is called “help and morals,” so the students learn about first aid, hygiene, how to prevent malaria, how to brush their teeth, how to take care of a wound, or the importance of clean water. The other phase of our teaching is doing “storying” from the Old Testament. We’ll tell about the life of Moses, or we’ll talk about the life of Joseph and what happens when there’s not justice, or what happens when you have a hard time respecting your parents. I also do home visits mostly with the gals, and it’s an opportunity as I develop one-on-one relationships with them, to share about my hope and about Jesus Christ. It’s a tool that God is using to help me build relationships in the community and give kids life skills. Q: Since they’re Muslim, are they familiar with stories from the Old Testament? A: They have usually heard of Abraham, but they have different views on who Ishmael was and who was sacrificed, and all those kinds of things. Probably most are not that familiar with Old Testament stories, but they’re not that familiar with the Quran either, because they don’t read Arabic, and that’s the only recognized language to read the Quran in. Q: Who comes to mind as a student was was very impacted by one of these classes? A: I would say one of my neighbors. She actually didn’t even go to the school that I was teaching at, but she asked if she could come to the classes and she came to the classes faithfully for a whole year. And we had a lot of discussions about different life skill practices that they do in their home, but we also had discussions about who Christ is, and about if it’s possible to turn from the way you’ve been taught by your ancestors and your parents—is that even a possible thing in that culture? She’ll talk about her discouragement or her lack of hope that she’ll ever be able to do anything besides selling onions. She hasn’t been able to pass tenth grade and has pretty much given up on school. But she calls me “mom,” and if she’s sick she’ll come over and spend the night, just so she has somebody to check on her because her mom is usually traveling. She’s a dear girl. Q: How would you describe the importance of missionaries educating national students versus third culture kids? A: I think my passion is to see the next generation formed to be people of integrity, to be people who have a relationship with Jesus Christ. Oftentimes young people are more open to newer ideas, especially those that are studying away from their family and away from some of the peer pressure they would normally experience. Young people—whether they come from believing missionary families or if they come from a remote village chief’s family—have a need to know peace in their lives and a sense of hope, and they need an intimate relationship with God through Jesus Christ. That transcends culture and religious background. Nobody is a Christian because their parents are missionaries. It’s just two sides of the same coin. If you’re working with MKs, that’s allowing their parents to be more engaged rather than spending all their time homeschooling. Wherever you live, whether you’re working with MKs or nationals, you’re still going to have connections with both in your community. It’s not one or the other; it’s both. I don’t see it as a competitive or different thing; it’s just where your focus, skill set, and passion are. Q: You’re a nurse and a teacher. How do you balance the two, and what led you down the path of pursuing both? A: I ran a medical clinic for many years, but after a while I felt like maybe I could make an even more significant impact in helping people prevent disease and prevent disability and prevent choices that will have negative consequences for the rest of their lives. I loved working with students, so it was kind of a natural progression and when I went out to work among a least-reached people group in Guinea, it seemed like a good fit with the team. I use a lot of materials from Community Health Evangelism and Community Health Education (CHE), which provides me a lot of resources to use in teaching. I probably see 20 people a week that are sick and I diagnose them and write out a prescription, but I try to limit that and not turn it into a clinic, just because I wouldn’t have time to do the preventative teaching, which in the long run, if people change their behaviors, they prevent illness or disability from happening. Q: How have you seen preventative health education affect the people you work with in Guinea? A: There is a young man who worked with me in a village health ministry, and he really latched on to wound care. He started traveling around to different villages at his own expense on his motorcycle to other villages taking care of people’s wounds, and as I visited other villages, it’s been amazing. There have been significantly less infections than there used to be in the whole area, and there are probably 10 or 12 villages that come to that health clinic because of the health teaching that went on with wound care. Q: What has been a highlight from you medical service in Guinea? A: There was a village near my home where I went to treat two men who had second and third degree burns all over their faces and chests. They wouldn’t let me take them to the hospital because the village felt like they were gonna pass away and they didn’t want them to die in town. One of them was unconscious. I treated their burns and after three days, I went back, being sure that one of them would have passed away, but neither one of them did! And within three weeks their burns were completely healed. It would have taken months if it had happened in the States. It was a miracle. The village chief said, “You’re welcome to come here and teach; your God is a god that answers prayer, and we know you’re a person of prayer, so you’re welcome to come teach in this village.” So my ministry partners and I went and taught in that village for two years every Friday afternoon, training people to be health agents, and it was because of what God did, miraculously healing these men. Q: How would you describe the unreached people group in Guinea, the Maninka? A: The Maninka live in a huge amount of fear: fear of their children getting sick, fear of not having enough to eat, fear of the crops not coming in, fear of someone else doing evil to them. Fear is what characterizes their feelings about God, because He’s so distant to them and He is someone that may be punitive. Paradise is elusive to them because they don’t have money to go on a pilgrimage to Mecca; they can’t follow through with the basic pillars of Islam. But they are extremely hospitable and very kind to strangers. Q: You’ve been through a lot of crisis situations, from having to evacuate Cote d’Ivoire during its civil war, to the recent ebola outbreak. Looking back, how have you seen God’s provision through these situations? A: I have seen God’s people surround me in a really powerful way through prayer. God responds to people praying. When I came back to the States after the crisis in Cote D’Ivoire, I was a very broken person and even to this point in time I struggle with mental illness. I need to be under the care of mental health professionals and on medication because there are scars in my life that are pretty deep due to that trauma. 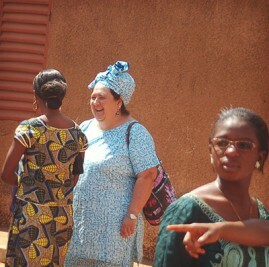 Q: What do you see God really doing in Guinea in recent years? A: What I feel like I’m doing is moving rocks. I’m planting seeds, but I’m moving a lot of rocks, and there have not been a lot of sprouts in the garden. Many people have been seeking and have asked questions, but they don’t choose to follow the Jesus road because of family and peer pressure. So I often have doubts that God is working in people’s hearts and minds, and I know from His word and His nature that He is drawing people to Himself. I’ve been in Guinea 11 years, and I have yet to be an influential person in somebody’s life who’s walking the Jesus road. That just hasn’t happened, and it is discouraging. But God is about holistic transformation in people’s lives and there may be some that have come to faith, but they’re keeping it a secret because of the fear of persecution.